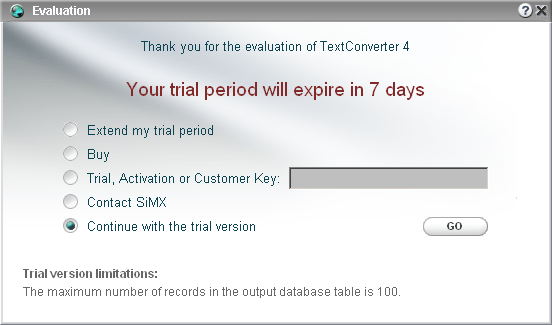 You can check "Continue with the trial version" and proceed with the trial version if the evaluation period has not expired yet. Select "Extend my trial period" if you wish to request an extension for your trial period. Select "Buy" to buy the product online directly from SiMX. We accept PayPal and all major credit cards. Select "Trial, Activation or Customer Key" if you have either Trial, Activation or Customer key. Select "Contact SiMX" to contact us with any questions you have regarding the product. Click the "Go" button to continue with the application. The application will be automatically closed if your trial period has expired and you did not supply any key.